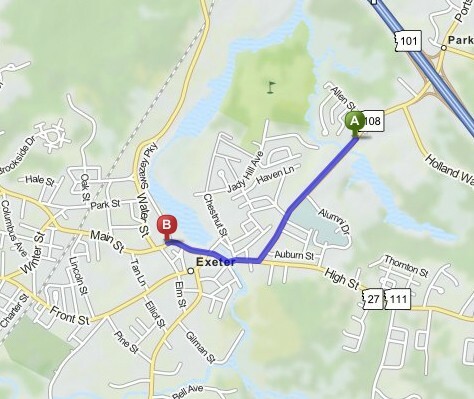 The Exeter Holiday Parade kicks off at approximately 5:30pm from the OSRAM Plant at 131 Portsmouth Avenue. The parade heads out of the OSRAM entrance, making a left onto Portsmouth Avenue. The parade continues to the end of Portsmouth Avenue and then makes a right onto High Street. The parade continues straight onto Water Street passing the bandstand and ending at the entrance to Swasey Parkway. Please note: the viewing of the parade ends at Swasey Parkway. All floats continue their journey up to Lincoln Street before the float riders can disembark. The only apparatus allowed on Swasey Parkway are the marching bands and entries with horses. The parade is approximately 1 hour from start to finish and 1.1 miles long (for those of you walking). The parade route will be close from approximately 5:00pm – 7:00pm.